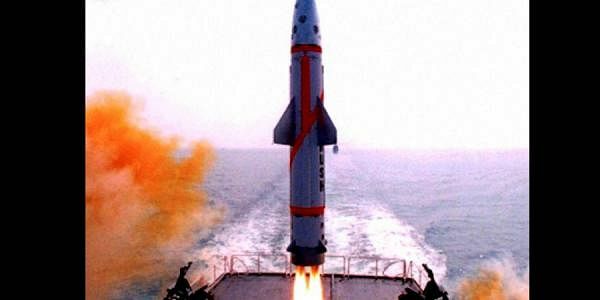 A day after the Indian Army struck gold with Prithvi-II, the Navy on Friday achieved another milestone in its on-going strategic programme with the successful flight testing of nuke-capable surface-to-surface ballistic missile, ‘Dhanush’, from a Naval warship in the Bay of Bengal. The trial termed as ‘training exercise’ was conducted at around 11.25 am from an undisclosed location. The test was carried out by the Strategic Forces Command (SFC) of the Navy. Defence sources said ‘Dhanush’ was test fired during its final operational configuration from ‘INS Subhadra’ warship anchored somewhere about 45 km off Puri coast. Another warship INS Rajput provided all essential support for the test. It was the ninth test of the anti-ship missile. The missile maintained its intended trajectory before plunging into the sea. The test launch was tracked from its take-off to the impact point through an integrated network of sophisticated radars and electro-optic instruments for data analysis. All the mission sequencing events occurred as expected, sources added. DRDO chief and scientific advisor to Defence Minister V K Saraswat said it was a textbook launch.